Khon Kaen (Thailand) – January 26, 2018 (travelindex.com) – Mrs. Supawan Teerarat, Senior Vice President, Strategic Business Development and Innovation of TCEB joined hand with Khon Kaen province, The Pacific Asia Travel Association (PATA) and Tourism Authority of Thailand (TAT) held the press conference to announce “PATA Destination Marketing Forum 2018” to be held in Khon Kaen, Thailand from 28-30 November 2018. The event contributes to implementing the government’s policy of stimulating and developing the regional economy. Khon Kaen is one of Thailand’s leading MICE cities, with strong potential and readiness to host international conventions to world-class standards. This event offers an important platform for all MICE stakeholders, including private sector companies, MICE operators and tourism businesses across the Asia-Pacific region. In particular the event will maximize benefits to Thai participants both from Khon Kaen itself, and from secondary MICE cities around the country. 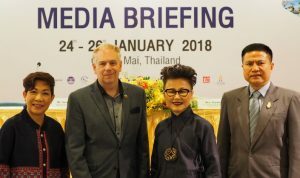 The event will contribute greatly to raising visibility and awareness of Khon Kaen and other regional MICE cities as international MICE destinations which helps to generate sustainable economic development in the regional economy.